Ramateertham (sometimes spelled as Ramatheertham) (Telugu: రామాతీర్థం) is a village panchayat in Nellimarla mandal of Vizianagaram district in Andhra Pradesh in India.It is about 12 kilometers from Vizianagaram city. It is a famous Pilgrimage and also Ancient Historical Site since 3rd Century BCE There is a post office at Ramateertham. The PIN code is 535 218. Ramateertham is one of the places made sacred by a traditional connection with Rama. The temple and village at the base of a chain of hills of solid rock on which are some perennial springs of water, and various places each in a way associated with the name of Rama. The Jains have also had a residence here, their remains consisting chiefly of natural caves with slab sculptures set in them, and some small ruined brick temples. It is one of the few places in this direction where Jaina remains exist. The only notice of buried remains here is in Sewel's Lists (Vol. I, page 15) where mention is made of great heaps of broken bricks and cut stones on a hill which is difficult of access. It was hitherto unknown that these remains were Buddhist, and this I only discovered last season. Since that time, excavations have been conducted and resulted in the unearthing of an extensive part of what has undoubtedly been a large and important Buddhist monastery. The Black Granite hills on which you can find the ruins of some Buddhist and Jain structures known as Bodhikonda. Apart from it there are two other hills by name Gurabaktakonda (Gurubhakthulakonda) and Ghani konda (also known as Durga Konda) on which you can find a 3rd-century BC Buddhist Monastic complex Remains and Rock-cut caves with Jain Tirthankara images on the walls of the caves.This Place has a Historical Importance as both the religions of Buddhism and Jainism flourished temporarily over here. 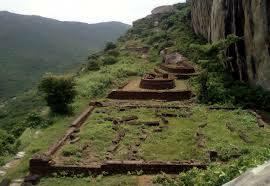 At this place also the Buddhists are shown to have had a prior settlement in a place now sacred to the Jains.